Laughter, love, and loyalty. Those three sentiments reverberated throughout the Ukrop Auditorium Thursday night for the Alumni Hall of Fame induction for Bobby Ukrop, B’69. 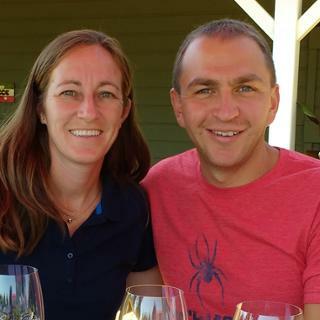 Ukrop has been devoted to the University of Richmond and the Robins School of Business since his graduation, by serving on the Board of Trustees, the University Parent Leadership Council, the Alumni Association Board of Directors, and the Robins School of Business Executive Advisory Council. “His character, his ethical standards, his trustworthiness, his sense of direction, his community service, his loyalty to his alma mater, his business acumen, and his family leadership set good examples for us all,” said Dr. Bruce Heilman, chancellor and president emeritus of the University of Richmond. Ukrop served on the Board of Trustees during Heilman’s tenure as president. Ukrop is the chairman and CEO of Ukrop’s Homestyle Foods, a producer of prepared foods and baked goods for food retailers in Virginia and adjacent states. He began his business career in 1962 as a part-time courtesy clerk at Ukrop’s Super Market during high school. He had a 40-year career at Ukrop’s Super Markets, Inc., the last twelve as CEO. He, along with Dean Nancy Bagranoff, reflected on Ukrop’s commitment to the University of Richmond. Ukrop dedicated many of his remarks to the people sitting in the room, including his wife Jane, his four children, their spouses, and his eleven grandchildren. He recognized his siblings and other family members, his professors, and his classmates who were all in attendance. He recalled fondly his interactions with Dean W. David Robbins, who served as dean of the business school while Ukrop was a student. 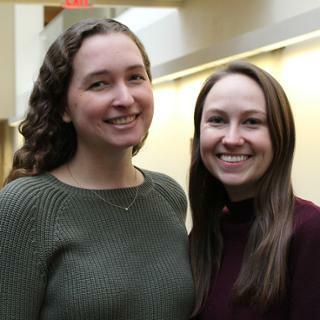 Specifically, when Ukrop lost an election to become student body president, he remembers Robbins encouraging him, and suggesting he lead Alpha Kappa Psi, a business fraternity, instead, which reinvigorated the club, that is still active today. Ukrop is the fourth inductee to the Robins School of Business Alumni Hall of Fame. It was founded to recognize alumni who have made significant accomplishments in business and service. The other inductees are E. Claiborne Robins, R’31, Austin Brockenbrough III, B’62, and Melanie Healey, B’83. 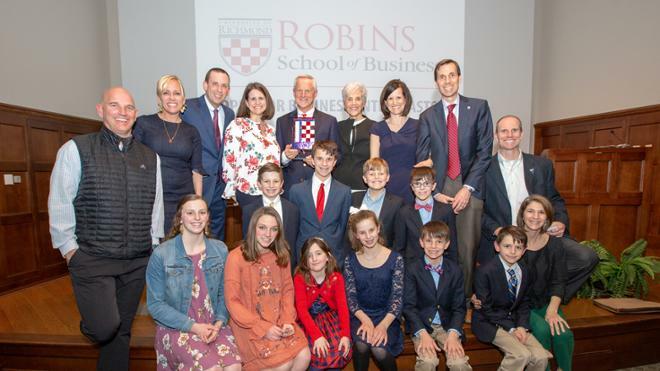 Finally, Ukrop recognized the role the Robins School of Business and the University of Richmond have played in his life, and thanked all those who supported him on his journey.